Bulimia Weight Loss – Fact or Fiction? There is a commonly held belief that bulimia, or more specifically the compensatory behavior of purging, helps with weight loss. However, beliefs are not necessarily true. So, is bulimia weight loss Fact or Fiction? Read on to discover the truth. Now I know from my own experience that it can seem like bulimia weight loss is Fact: It seems the strategies of throwing up, exercising frantically, using laxatives etc and or restricting your food intake in some way, does compensate for overeating, breaking dietary rules or bingeing. And therein lies the trap: Initially they can work and because of this, the idea ‘you can lose weight with bulimia’ is validated. And besides it makes sense – right? If you throw up the food you’ve recently eaten, all things being equal you should at the very least counteract the binge and possibly loose weight. If you exercise like crazy, you should burn off the calories you’ve eaten. If you reduce your calorie intake; miss meals, or perhaps fast or ‘detox’ you should be able to counteract any effect of over-eating or bingeing. I remember watching the downward trend of the scales and receiving the compliments with joy. HOWEVER, ALL IS NOT WHAT IT SEEMS. The downward trend of the scales stops or gets erratic, you often feel fat and any happiness gets quickly replaced with confusion, frustration and fear. So How Come Bulimia Weight Loss Strategies Work Initially And Then Stop? The thing is you can’t fool Mother Nature, or not for too long! Whilst the compensating behaviours that follow bingeing may seem like effective weight loss strategies, Mother Nature soon bites back. And when you look at the Science, you’ll understand why. So let’s look at the science and research behind the 7 Most Common Bulimia Weight Loss Strategies and you can draw your own conclusion as to whether Bulimia Weight Loss is Fact or Fiction. 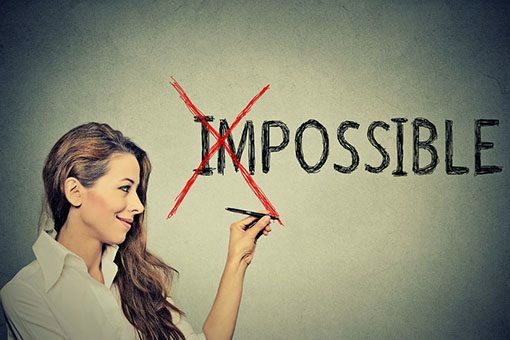 Maybe it will settle some doubt in your mind, if you believe there is something wrong with you that you can’t be bulimic and loose weight and maybe if you’re looking for some bulimia tips to loose weight, you’ll realise that loosing weight with bulimia simply won’t work. BULIMIA WEIGHT LOSS STRATEGY #1 Self Induced Vomiting. Self induced vomiting is perhaps the most common method of purging. However research shows that even if you throw up immediately after a binge your body has already absorbed 40% to 70% of the calories eaten! This means that realistically the number of calories you absorb from a binge, even after vomiting, is probably going to be greater than the number of calories you would have absorbed, if you’d eaten sensible-sized portions on a binge-free day. Bingeing has a tendency to become an increasingly frenzied, out of control behaviour and keeping track of what goes in and comes back up, even with ‘markers’ becomes harder. Overtime the binges become more frequent and larger as your body tries to compensate for the restriction. Sometimes no matter how hard you try, you cannot get all the food back up. Self Induced Vomiting Plays Havoc With Your Blood Sugar Levels and Encourages More Bingeing. Your pulse may quicken, you may experience palpitations and sweating is common. LOW BLOOD SUGAR LEVELS ARE DANGEROUS. Therefore this rapid and extreme drop in blood sugar needs further adjustment; more food, high in sugar and starch is required to ‘sweep’ up the insulin. For this reason, it’s common to actually have stronger cravings and urges to binge than it was before that cycle of bingeing and purging started! And so bingeing can become more frequent and out of your control. BULIMIA WEIGHT LOSS STRATEGY #2 Over-Exercising. Exercising may seem a more pleasant and less harmful way to to compensate for overeating or bingeing, than throwing up. On top of which we are told exercise is good for us: We are designed to move and we actually need to move, so exercise is a great thing for the body and has many health benefits. So more exercise should be better – right? Logic would say that by exercising enough you should be able to burn off the calories eaten. A notion validated by the plethora of machines and gadgets available, that tell you how many calories you are burning. Again, all is not what it seems: Whilst you can possibly manage or lose weight for a time through exercise – Mother Nature has her eye on you. Science now shows that weight loss through exercise is a myth. And over-exercising, especially when used to compensate for eating, over-eating or bingeing, and or to create a calorie deficit, in an attempt to lose weight, can pose serious physical and mental health risks. The truth is whilst exercise makes your body more efficient at burning calories, due to your metabolism being raised, it also has a tendency to INCREASE your appetite**. Have food and eating in the fore front of your mind. Rather than burning fat, muscle fiber is broken down for energy: When you use muscle fiber, you lose muscle mass, the very thing that helps you burn calories and keeps your body toned and in good shape! And if most of your energy intake (calories) is being used for exercise, the body will start lowering it’s basic metabolic rate. Fewer calories are then required for the effective functioning of your body, making it harder for you to lose weight. A slowed metabolism compromises digestion and reduces the speed at which food moves through the gut. This can cause weight gain, bloating, gas and constipation; conditions that make you feel fat, and are common triggers for bingeing. If your basic metabolic rate goes too low, your health will be seriously compromised. If you still think over-exercising works to help you lose or control your weight or you HAVE TO EXERCISE, that is you have an overwhelming desire to exercise and burn calories or you must burn the calories you’ve eaten, please click HERE to check out the serious health risks posed by this behaviour. ** INCREASED Appetite: You may not necessarily experience an increase in appetite immediately after exercise, particularly intense exercise, due to the suppression of the hormone ghrelin. However, ghrelin levels go back to normal after about half an hour, so you may incorrectly assume that your hunger is down to something other than the exercise you’ve just done. Lastly, exercise can increase your weight as you build muscle, although you may be loosing inches from various parts of your body, so the number on the scales is not a reliable indicator of what is going on. Many people believe that they will be able to control their weight or counter the effects of a binge by taking laxatives. However, because laxatives ONLY work in the lower part of the digestive tract, by which point most of the food that’s been eaten has been absorbed, they do not mitigate the consequences of a binge. Any ‘weight loss’ is a temporary loss caused by the loss of water and returns once the body is re-hydrated. Now you might be tempted to avoid re-hydrating yourself so you can avoid the water weight but correct hydration is vital for your health and well being. Not re-hydrating can lead to serious health complications and even death. If you are using laxatives or have become dependant on them please read the dangers of laxative abuse. Similar to laxatives, any weight loss from diuretics is due to water loss and will return once you have a drink. Diuretics have NO EFFECT on calorie consumption whatsoever. A common side effect of the overuse of diuretics is dehydration. And when you’re dehydrated it can cause your body to hold onto water. This doesn’t just increase your weight, but it makes you feel uncomfortable, bloated and constipated and for many people, ‘feeling fat’ can trigger bingeing. BULIMIA WEIGHT LOSS STRATEGY#5 Controlling Your Food Intake. Possibly even before bulimia fully develops, especially if you’d been following a restrictive diet, the body ADAPTS to the restricted food intake and erratic eating patterns by LOWERING the body’s Basal Metabolic Rate** and INCREASING Fat Conversion. This reverses the trend of weight loss and increases the chances of weight gain, even though you maybe eating less! ** The Basal Metabolic Rate (BMR) is an estimate of how many calories you’d burn doing nothing but rest for 24 hours. It represents the minimum amount of energy needed to keep your body functioning effectively, including breathing, digestion, brain function and keeping your heart beating. As an example the average BMR for a 28 year old woman is approximately 1586 calories, which is higher than the calories recommend in many diets and is why so many people struggle sticking to them. This adaptation to food restriction is hard-wired into our brains and is triggered whenever the brain perceives a famine – which is exactly how the brain perceives dieting – regardless of your conscious desire to diet and loose weight. 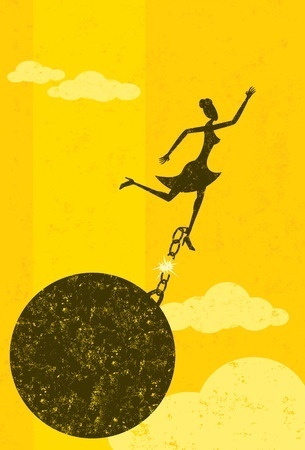 After the initial Honeymoon period where there is some weight loss, RESTRICTIVE DIETING in any form (calorie counting, avoiding or missing out certain food groups, missing meals etc) is generally the MAIN TRIGGER for bingeing and the start of the cycle of binging and purging behaviours that ultimately lead to weight gain. The demand for fuel is first experienced as an increase in appetite or hunger. If that hunger isn’t satisfied you will begin to obsess about food and eating and experience overwhelming cravings and urges to eat. Not just that, you will find yourself compelled to seek out food and when you find it, eat as much as possible. . These demands and compulsions are automatic, that is they are outside your conscious control and can be quite frightening. And as they run counter to your desire to lose weight, you find yourself at war with your body and mind: Food becomes the enemy and consequently there is a lot of anxiety and agitation experienced around food and eating. The inner conflict becomes increasing stressful physically, mentally and emotionally. Stress is further increased with the physical, mental and emotional stress brought on by any compensatory behaviors of purging. This chronic level of stress raises the levels of the cortisol level, which is linked to weight gain. For more information read Low Calorie Dieting Increases Cortisol. An important thing to know is that many bulimics actually lose weight when they replace bingeing and purging with healthy patterns of eating. The old adage, “if it is too good to be true, it probably is” fits the promises made by the advertisers of diet pills and teas. The way results are achieved, tend to be unhealthy and unsustainable. And because diet pills and potions are unregulated and with the possibility of buying them online, some are not just ineffective but dangerous and can kill you! I remember resorting to drastic measures to divert my attention away from my desire to eat, curb my cravings and prevent myself from bingeing. This included a variety of slimming pills, both over the counter and prescription – ultimately none of them worked. But I didn’t come to that conclusion until after I’d become increasing dependent, for a time, on more and or stronger substances and made myself quite ill.
As with laxatives and durietics, you can come to believe that you need diet pills, especially those that have addictive qualities and make you feel better when you take them. However like anything addictive, over time you need more, or stronger, to get the same effect. Whilst some of the side effects are short term and go when you stop taking the pills or teas, some are not; long-term use of some diet pills can have serious consequences, especially for those with underlying vulnerabilities. Despite the FDA banning many of the harmful ingredients that were added to diet / slimming pills and teas, they make their way back into the market through the internet and poor regulation of dietary supplements. As with anything that artificially restricts your food intake and or reduces your body weight below what is a good weight for your body, Mother Nature will work to redress it. With the adverse side effects of diet pills, some of which are listed below, are ask you is it worth it? The adverse side effects of Diet Pills. BULIMIA WEIGHT LOSS STRATEGY #7 Will Power. Unfortunately this is not the case. Rather than helping you lose weight, ‘trying‘ to use will power, can actually make you gain weight. I say ‘trying‘ to use will power because it’s likely you’ve experienced that it’s often not long, before you cave in and eat what you didn’t want to or didn’t think you should eat. The thing is we human beings only have so much will power before it is depleted. You may not have thought about this but exerting Will Power USES UP ENERGY. And in one way or another your Will Power is being drained throughout the day, and I’m not just talking around food. YOU ARE DEPLETING YOUR WILL POWER RESERVE. Your Will Power store is going down and it’s going down fast. Using Will power as a Bulimia Weight Loss strategy causes stress, initiating the release of Cortisol, the hormone linked to weight gain. Persistent high levels of Cortisol not only make you feel anxious and disrupt sleep which further compromise Will Power, it can also make you eat! Maybe It’s Time Break Free From Any Bulimia Weight Loss Strategies. The truth is the behaviours and strategies associated with bulimia weight loss and any form of restrictive dieting, are counterproductive. 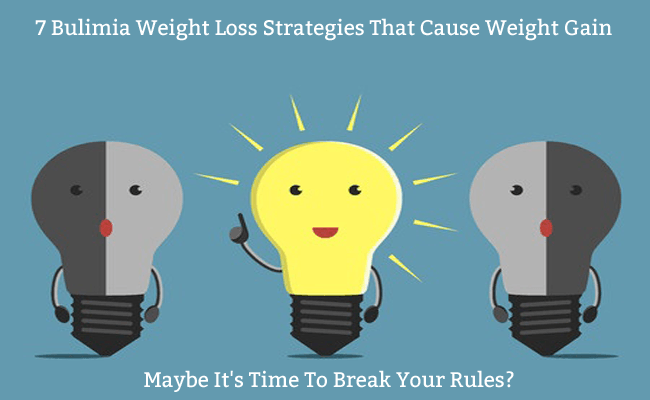 Rather than help you lose, maintain or control your weight, they only serve to make your weight more uncontrollable, more variable and ultimately weight gain. None of which is conducive to your happiness. So if you are toying with the idea of using any of these bulimia weight loss strategies, I’d be more than happy to speak with you to show you how you can reach your goals without resorting to these behaviours. If you are struggling with bulimia you’ll be far more likely to lose weight if you stop purging NOW and eat healthy, nutritious meals with enough calories for your body’s requirements on a regular basis, consistently over time. For some people this is relatively easy but for the majority of people suffering from bulimia eating in this way can be difficult because of underlying fears and beliefs. It can become even more challenging if you’ve had bulimia for sometime because of the habitual nature of the behavior and unconscious programming to binge under certain emotional conditions. If you’d like some help please email me at Julie@BulimiaFree.com. Ednos is different from bulimia right? Basically Ednos is an eating disorder that does not fit neatly into the specific criteria for other eating disorders such as bulimia or anorexia. This means someone may show all the symptoms of bulimia, but they are binging/purging less than once a week and/or for less than 3 months. Just because someone is bingeing and purging less than once a week and / or for less than 3 months doesn’t mean that their behaviours are any less serious. Bingeing and purging are risky behaviours, regardless of their frequency; it’s not always the severity of the eating disorder / the frequency of behaviours that is the problem but an underlying weakness in the body’s system that causes serious physical and mental health problems, including death. Giana, if you are bingeing and purging please seek help or you can contact me by replying to this email. For 15 years or so I binged and purged but that was over 20 years ago now, and I did not get fat in the recovery process. I can help you stop the bingeing and purging and get to your ideal weight without resorting to dangerous practices. You can as they say, have your cake and eat it. I’M Beatrice, 31 yrs old Italian woman who lives in London and struggled with anorexia for 10yrs and bulimia from 5yrs!!! I’m seeing a dietitian, Psychologist and psychiatry but after few month now I’m back with binge eating and find it hard to stop it!! i gained 8kg in the last few month I’m so terrified to carry on like this!!! It has been for the last few days that i’m searching any possible “fast, quick, not -pain solutions” hypnosis, pills, acupuncture but can’t decid/find the right quickest one!!! I would like to wake up tomorow and find myself in the shape that i was!!! I NEED SOME REAL HELP, i don’t want any more words, word and more words….!!!!! Hi Beatrice I have sent you a reply via email but unfortunately emails from someone you haven’t heard from before can end up in spam so I”m also leaving a message here for you. My name is Julie and I’ve been successfully helping woman, all over the world, from all walks of life, recover from Bulimia. Many, like yourself, had seen dietitians, psychologists and psychiatrists to no avail and felt confused, frustrated and completely lost, however by following what I did to break free from bulimia, for over 20 years now (without getting fat), they broke free from bulimia too. From what you write you are wanting real help to break free, so how about we have a chat on Skype, WhatsApp or Facebook Messenger, so you can tell me a bit more about your situation and I can share with you how I can help. Simply email me, Julie@BulimiaFree.com with a couple of dates and times when you’d be free and I will get back to you immediately to confirm. Thank you for writing this. I’m 22 and have recently started cycle of purging within the last month or so. I also have a history of purging during my middle school years as well.. I can hear your confusion about what to do to get what you want in your email. You’re right about it spiralling out of control and sometimes it’s not so slowly. From personal experience and now speaking to women from all over the world struggling with bulimia, I know just how quickly that control can go and once you are there it is so much harder to stop. so what you are saying is that no matter what I do I’m NEVER going to lose weight? Ok then…. I just wanted to let you know that I was not saying “you’re never going to lose weight” or one can’t lose weight. What I was saying is the behaviours of bulimia; Self Induced Vomiting, Over Exercising, Laxatives, Diuretics, Controlling Your Food Intake, Weight Loss Pills, Will Power, won’t lead to permanent weight loss, or support weight maintenance. In fact quite the contrary, they will ultimately make you can weight. If you are doing these behaviours and or want to lose weight in a healthy way then please do write back to me, Julie@BulimiaFree.com There are ways, just not the behaviours I discussed in the post. Thank you for writing this. I’ve struggled with bulimia on and off for 17 years now. This last go around has gotten so out of control. I’ve never weighed so much before and i’m really struggling with it. I want to stop this cycle but i just cant. Friends and family know about it but they don’t know just how bad its gotten. Many thanks for visiting my website and leaving your message. From what you write it sounds like you’ve been able to stop the behaviour in the past and that is good news. It means you can stop. However without knowing a bit more about you I can’t really give you any advice about what you should / could do now. However I would however be delighted to have a chat with you, to see why it is you can’t stop this time and what you need to do, to stop. Over the years of supporting people to bulimia freedom, experience has taught me, that for any advice to be meaningful and helpful, we really need to have a conversation. If you’d like to chat please reply email Julie@BulimiaFree.com with some dates and times when you’d be available to chat.